Nimble Bulk Email Marketing Web Application is a fully-featured, easy to use Email Marketing Web Application coded in PHP version 5.6.4 / Laravel 5.4 that lets you send high-volume marketing emails via your own server or through other email service (SMTP) providers. Start making money by easily developing your database leads, by location, business category. Filter your leads, sale your leads. 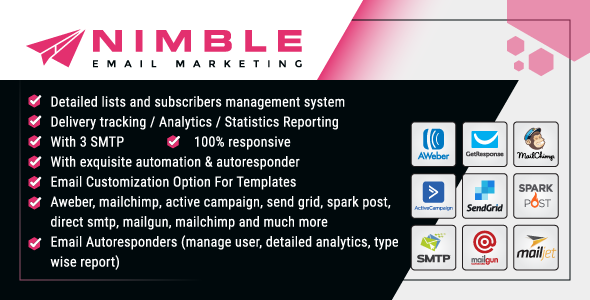 Nimble Email Marketing Applications works 100% fine with any compatible browser. Install Nimble Bulk Email Marketing Web Application on your own web server and you can use marketing / transaction emails without any limitation. You can get rid of expensive email services as well. Nimble Bulk Email Marketing Web Application is a brilliant Idea of having all marketing tools in one place, versatile, robust and most of all very expandable. Basically it’s designed and developed by keeping in mind the basic necessities of small and large businesses and organizations. In fact, Nimble Bulk Email Marketing Web Application is the only Marketing Web Application that has most of the features and functionalities when you compare with any other email marketing application at the web. Nimble Bulk Email Marketing Web Application provides with a unique solution to manage all your contacts, by using the options, you can build your marketing strategy based on either the company name or the job title, or even both. This functionality is very practical for those seeking to target certain business segmentations such Human Resources Managers, CEO’s, Suppliers, Decisions makers etc. Nimble Bulk Email Marketing Web Application is by far the only bulk email marketing application that makes it easy for users to create a beautiful newsletter or marketing campaign, we have introduced a spectacular customized Nimble editor which makes it everything easier for and within reach. You can add / edit templates (which can be created as a new or you may use existing premade templates) with just a click, you can even add your own templates or html section as click and drop in that template box. With our advance social icons & share, you can include your preferred social media networks easily. You may also use the drag and drop campaigns scheduler to send targeted emails on special occasions like sale, holiday or any other social events. tracking your campaign got also easy, thanks to both native email behavior tracking and our analytics integration, we have made it easier for you to check the states directly from the email applications main dashboard and specifically from your campaign, each and every single campaign is traceable for better understanding of the success of you marketing strategies. To make your templates easily interpreted and fast we have included an inline css that convert each template to the right format. Working images as adding texts and patterns is also supported, basically, you do anything with it. Nimble Bulk Email Marketing Web Application can support multiple SMTP servers, capable of working in parallel and also jumping to the next available server as soon as your established limit is reached. - Multi-users each user has his distinct account, only the master admin have access to users area. - Unlimited Groups (Deep List Segmentation). - Unlimited Smart SMTP Servers Relay: SMTP, PHP Mailer, Gmail (Auto Detect & Bounce Servers Limits). - Bounce Mail Handler (PHP Library should be enabled). - Parallel Delivery (In respect to each server limit). - Address Validator & Finder. - Export to Multiple formats: VCARD, CSV, EXCEL, PDF, & Most used Avery Labels. - Easy members import using CSV. - Find Subscribers based Address, Status or Groups. - Smart Campaign Scheduler Calendar. - Internal Activity Log Table. - Campaigns History, Export, and Duplication. - Campaigns Activity Tracking, Bounce, Open, Unsubscribe, Sent, Unsent etc. - Advanced Graphical Statistic Reporting. - Form script Integration (Installation). - Native Captcha Spam System (will be added soon). - Google Recaptcha (will be added soon). - Cache Memory Limit Control for faster processing. - Send Emails (batches or group wise). - Custom Pre-Built Templates easy Insertion. - Subscribers Imports Limit Control for faster processing. - Subscribers Tags (First Name, Last Name, Address, City, Zip Code, State, Country, IP Address, Web etc..). Many more. We are also available for help so in case you need any customization or support for this script. Please drop a message in pm or email at: azhar@ranksol.com Our engineers and support team will help you out with best possible services and solutions within the most least possible time. Please be advised that we do not proceed with any refunds, therefore, it s important to test it prior to any purchase, we guarantee, it is as it is working on our demo. Thank you again for your business.